Sometimes, the internet delivers us delightful things. In the past few days, I’ve read a few articles about the Japanese scientist who has promised to grow a live woolly mammoth within five or six years. 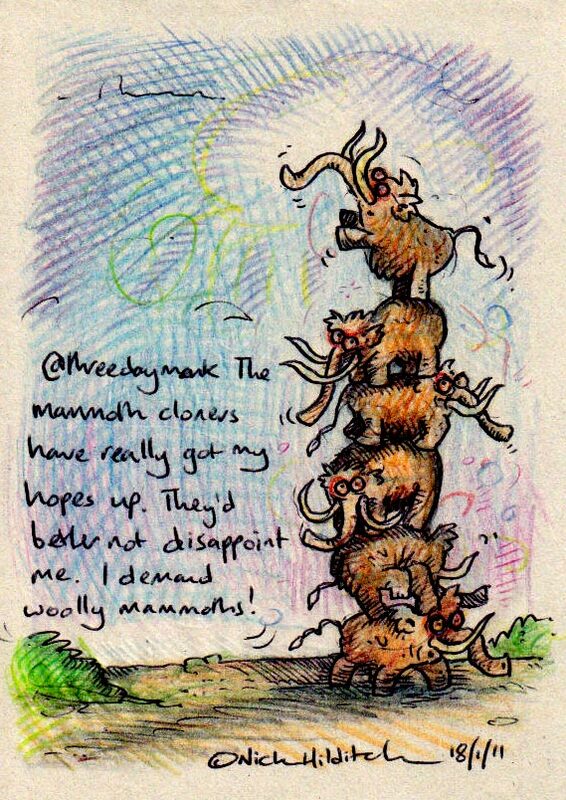 I would love to see a real live woolly mammoth! I’ve seen some bits of mammoth from the Siberian permafrost (at the Aichi World Expo in 2005), and that merely whetted my appetite. The mammoth cloners have really got my hopes up. They’d better not disappoint me. I demand woolly mammoths! Irkafirka is an interesting project: they choose random tweets that inspire them, and post an illustration. Today, I was that random inspiration. Next: How much for a favicon?